Our Load Management Relays provide all the same capabilities as our Customer Interface Relays (CIRs) and also include other features to make interfacing with load management equipment fast and easy. The great thing about our CIRs and LMRs is that they contain separate compartments for utility and customer use. The upper compartment (for utility use) can be locked and is accessible only to utility metering personnel. It contains all of the electronics along with fusing that is coordinated with the fusing contained within the customer compartment. The lower “customer” compartment is used for connections from utility metering & load management equipment to customer energy or demand management systems and equipment. Like all of our Solid State Instrument isolation relays, the LMRs will help protect against transient damage caused by a nearby lightning strike, voltage transients, static electricity, a shorted wire, or incorrectly applied power. 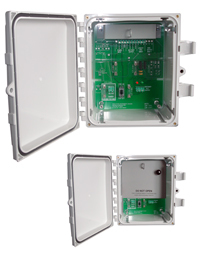 What makes our Load Management Relays unique is that they provide a convenient place to terminate all connections for the utilities’ load management receivers, as well as providing pulse outputs for energy information that may be needed on the customer end. A LMR also provides an auxiliary voltage source to power the load management receiver or other telemetry equipment, thus eliminating the need to buy an additional power supply. This means less time and money spent trying to figure out additional mounting and wiring configurations, and allows for better system integration. Another great feature the LMRs provide is the test switch to check whether your electric loads will respond when the utility sends a load management signal. The switch replicates the action of the control signal making it possible to verify that all controlled loads are communicating and operating effectively when the utility control signal is actually sent. The LMR-1PS is our standard load management relay offering two outputs in the utility compartment and one output in the customer compartment. Our LMR-111PS and 121PS were created to provide +12VDC voltages in addition to the standard 120 VAC, allowing for various types of equipment to be used on the receiving end of a LMR. Contact us if you have a need for other output voltages.